The alpha vane (also called AoA vane) is an external probe used to measure the angle of attack. I have been trying to understand how exactly it works, but I can't find any clear explanation or simulation. Is the vane static or dynamic i.e. does it rotate along its central axis? In short, how does an alpha vane work? From what I have studied at my instrumentation course, it rotates and reads the angle between the current position and the reference position. You then have several (3-4) of them around the fuselage because a roll maneuver (for example) will alter the measurements asymmetrically and in this way you can compensate for this effect. An AOA vane (like what you have shown) works by aligning itself with the local airflow, like an arrow. The angle to some reference line (normally aircraft fuselage horizontal) is then measured with a potentiometer/RVDT/etc. This is the local angle of attack. Often the local angle of attack is converted to aircraft angle of attack through a calibration curve. Most transport airplanes have 2 vanes. 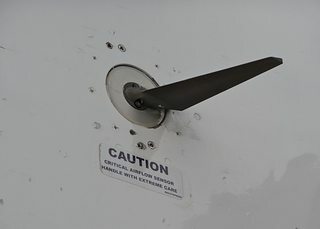 If either vane shows an angle of attack that is approaching stall, the stall warning will alert the pilot(s) that stall is near. If both AOA vanes are at the stall AOA, a stick pusher will activate to alleviate the aerodynamic stall. The AOA values are never averaged. Depending on the AOA computer, logic is used to determine if one of the vanes is giving bad data. Not the answer you're looking for? Browse other questions tagged aircraft-systems avionics flight-instruments angle-of-attack sensors or ask your own question. How do aircraft stall warning systems work? What additional functionality is provided by the F-14 nose pitot, absent in early models? How does flight control surface authority change with AOA? What does “alpha floor” mean? How does terrain alert system work? Which 737 generations doesn't have Alpha Vane (Angle of Attack sensor)? How many AOA sensors does the 737 MAX have?